Interestingly enough my last post on the previous subject would fit better here. That said, while there definitely are some rose-colored glasses dreamers out there (L5 Society and the likes) there are also plenty of economists/realists (like Rutan) with practical, applicable plans for the exploitation of space as a viable commercial venture. I'd like to reiterate one point I brought up, though. A lot of people decry the "slowness" of our progress in space, most of them pointing out to having "fallen back" from the Moon. They think 50 years is a long time? In the perspective of a single life, yes, sure. But when has a single human endeavour taken only one lifetime to go from it's stuttering beginnings to a full implementation? We've been tryig to FLY for millenia, jumping off cliffs with wings glued to our backs. Even Da Vinci's dream of flight, probably the first time it had been looked at scientifically, didn't become realized until nearly 400 years later later. How many tried before Cllement Ader and the Wrights? How long did it take to get from the Flyer to the first rickety commercial airliner? A lot longer than 50 years. In 1857 Konstantin Tsiolkovsky was born. What Da Vinci did for aircraft, he did for rocketry: most of the work was on paper, but it was genius. In the 1940's Werner Von Braun developed the V2 rocket. In 1957 Sputnik went beep beep beep. In 2007 there were over 500 satellites, including a permanently manned space station, the second of its kind, the first truly international venture. Space Cynics: I should hope that they routinely use Sturgen's Law; 90% of anything is crap... which explains why humans spend so much of our time building crap-filters. Anyway, give us a destination in orbit and we'll go there in droves, but only if we can afford it; however, the longer an interesting place exsits, the more people will want to go and as the number of people going grows, the lower the cost, so the more people can go. It just takes one interesting destination to get the whole thing started...and maybe it's already started but we just haven't recognized exactly what it is yet. Ferrell: just being in orbit is plenty interesting, as we've already proven. If anything, micro gravity environment is one thing that is completely impossible to synthesize on Earth. Perspective is another, the lack of atmosphere is a third. Three good reason for our continued, and continuously expanding presence there. It has already started. We have not ever taken a step back since Sputnik. Yet again, I do not think the fact we haven't been back to the Moon is a step back. Apollo was the space equivalent of 1492: proof of concept. Now we build the infrastructure that will get us back on a more permanent basis. Our work in orbit is groundwork, and it has grown plenty since the days of the Moon missions. More and more nations have built launchers, private contractors are getting into the business, and overall our global space program has expanded by an order of magnitude since the late 60's early 70's. After saying in the other thread that I'd comment here, I won't even really do that, because it goes to the time scale of space, which I've been meaning to take up anyway. One of the staples of scifi aliens is the 'heavy worlder' where the alien evolves on a planet with more than 1G of gravity. I've suggested this elsewhere, but I suspect that WE are the heavy worlders (in so far as space going civilizations). Our own gravity is nearly insurmountable, a larger planet would likely hold more atmosphere thus compounding the problem. In fact that denser atmosphere may obscure space, thus removing the notion that there is anything out there. I would posit that a scifi setting should therefore provide lower gravity or even microgravity creatures as the standard with humans being hulking monsters by comparison. CJ: a lot of good points, although in my experience there have been as many heavy-worlder aliens as there have been light-worlder aliens. One thing most get wrong, however, is that the heavy-worlders are huge and the light-worlders really small. That would really compound their respective problems. Yes the heavy-worlders will need more muscles proportionately, but they would have to be much smaller to avoid piling on the mass and making it worse for themselves. Light-worlders however would be the tall ones, since size matters, and you can sustain a greater size far more easily in lighter gravity... That said our own Earth has been home to some pretty hulking creatures of no uncertain intelligence. Some of those dinos were plenty smart. We think. That said, I very much doubt a higher gravity would be insurmountable. Our rockets only put out 3 g's of acceleration because that's the best we can pile on for several minutes and still be functional enough to fly the thing. I took 3 g's in a centrifuge at Huntsville, and when I say functional, it's a pretty loose term. Your arms are heavy at 3 g's. You'd better have your controls at your fingertips, because lifting your arms to push buttons on a console is going to be rough. We can accelerate faster than we do, we simply accelerate only as fast was we need. But since our guys are heavy-worlders, they'd be able to pile on a commensurate amount of g's on top of that. It's a question of proportion and progression and not absolute numbers. Of course it's going to take some very hefty rockets, but it's not impossible, and it might be a good way to explain why they are neither angels nor cavemen: it just took them a lot longer to develop cheap space flight. As far as an atmosphere thick enough to block light, we'd be talking about a Venus-type world. It'd be hard for any life to develop down there. Certainly no photosynthesis possible. Perhaps around hot vents. You could get some really odd lifeforms down here. In any case, as soon as they climb up a mountain they're going to notice something odd. There's a reason we put telescopes on Cerro Paranal: there's a lot less air between the mirror and the stars. Although the idea of not knowing that there was something out there has been explored a few times: Asimov in Nightfall, and less seriously Douglas Adams with the Krikkits of the Hitchhiker's Guide. I would surmise that heavy worlders would not be bipedal. They would need many legs to support themselves in their own gravity. I suspect they wouldn't have fliers in their world because of the same reasons air launches are too expensive. In order to fly, you need to be light and have the power to fly. That means light bones and a lot of muscle. They would fracture in the heavy gravity. I suppose there could be hydrogen filled flying whales, but that is more analogous to swimming. In any case, there are a lot more hindrances to the development of spaceflight on a high gravity world. Lighter worlds would have the advantage (unless there is some aspect of lighter worlds that prevent life forming at all), thus thus the low-G worlders should be prevalent in space. As a side note, the most likely case is robots or non-crewed vessels, but that is not related to gravity so much. The difficulty for getting off a massive planet isn't the higher acceleration needed, it's the greater delta V to get from surface to orbit. 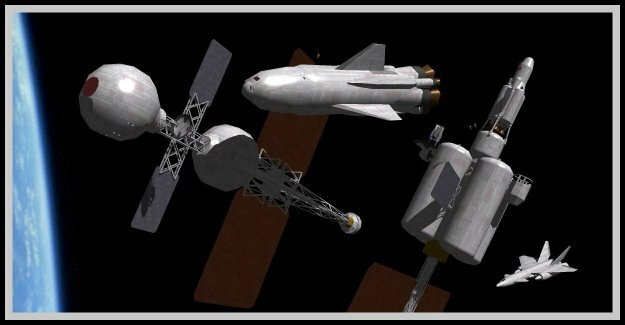 This would require even more stages to get into orbit with chemical rockets or using something else to get into orbit. I think the something else would almost have to be some sort of high thrust nuclear rocket. As for atmospheric flight, increasing air pressure/density will make flight easier. Doubling the air pressure far more than compensates for doubling the gravity. for a fun exercise in working out what such a world might be like. Acceleration isn't just an issue for the crew. It also means you need more thrust, another design challenge. The Saturn V could put on about 12 km/s, enough to orbit a heavy footed planet, but its liftoff acceleration of 1.4 g wouldn't get it off the pad. A dense atmosphere could favor airships, which might also be shaped to provide lift. If atmospheric density is 4x Earth, an airspeed of 100 knots provides as much lift as 200 knots indicated airspeed on Earth. But big planets get into whole other issues. Big planets may be thalassic, with a real hydrosphere, not the damp film Earth has. How about an 'ocean' 1000 km deep? I don't know that the lower layers would be much like water as we know it. Hell, Europa must have more liquid water than Earth - isn't its hydrosphere something like 100 km deep? I don't see any inherent reason why a mega ocean couldn't have intelligent aquatic life; organic rafts might even make 'land' life viable. But getting into space, or even finding out about it, would be tough. Dammit, you people give me ideas faster than I can blog them! Rick: "But big planets get into whole other issues. Big planets may be thalassic, with a real hydrosphere, not the damp film Earth has. How about an 'ocean' 1000 km deep? I don't know that the lower layers would be much like water as we know it." I saw some TV program about alien worlds several weeks ago and they speculated that water on heavy gravity worlds would, at only a few meters under the surface, would form into a crystal-like material. Now, THAT would be an odd world to live on. Maybe we should start looking at launch methods that don't rely on chemical rockets, or exclusively on chemical rockets for surface to LEO...even though chemical rockets are the method we know best and are a mature technology. COROT 7b Weather Channel: "Cloudy in the afternoon, with a chance of molten rock falling from the sky." A place that makes Venus look good by comparison!